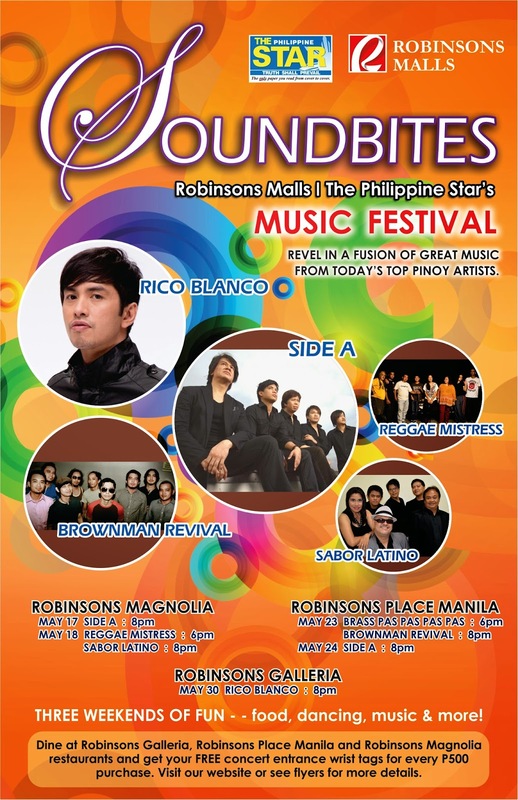 Think - Side A Band, Rico Blanco, Brownman Revival, Reggae Mistress and Sabor Latino! How about FREE tickets for the concert (and yes, you get to choose the weekend concert you want to attend!)? Plus, I am giving away 2 concert tickets to 1 of the lucky reader (keep on reading!). But one can join the party just by dining at the participating restaurants! Don't be too excited! Now, here are the details..
For every Php 500.00 single receipt purchase, a customer is entitled to one concert entrance wrist tag. But for receipts amounting more than Php 2,000.00, a customer can redeem a maximum of four wrist tags only. That awesome! As simple as dining at your favorite restaurant in Robinsons Mall, you get access to an OPM band concert! Please note, concert wrist tags must be claimed until 5:30PM at the venue entrance of the preferred concert for admission which is valid only for one day. Customers should present their receipts for validation during the redeeming of the wrist tags and during their entrance at the concert venue. Notes: Receipts will be stamped CLAIMED after concert attendant has validated the receipts and released the wrist tags to the customer. Robinsons Malls reserves the right to validate receipts. Receipts that are defaced, crumpled, tampered with, photocopied carbon-copied or smaller than the actual size will not be honored. Click Read More to see the list of participating restaurants and my giveaway details! Arya, Blackbeard’s Seafood Island, Buffet 101, Chef Noodles, Cibo, Classic Savory, Conti’s, Cyma, Elias, Gaucho, Gumbo, Kenny Rogers Roasters, Lombardi’s, Magnolia Flavor House, Mann Hann, Max’s, Mesa, Miso Hana, Miso Ten, Mr. Choi Kitchen, My Thai, Pasteleria La Terraza, Pho Hoa, Sizzling Pepper Steak, Sumosam, Tao Yuan, The Clubhouse, Uncle Cheffy, and Yabu. Aji Sen Ramen Noodles, Almon Marina, Banana Leaf, C2 Classic Cuisine, Cabalen, Cyma, Gerry’s Grill, Gumbo, Hainanese Delights, Healthy Shabu Shabu, Jack’s Loft, Mangan, Max’s, Mr. Choi Kitchen, New Bombay, Pancake House, Pepper Lunch, Pho Hoa, Racks, Recipes, Savory, Soi Thai, Tempura, The Aristocrat, The Old Spaghetti House, and Yakimix. Alex III, Blackbeard’s Seafood Island, Burgoo, Classic Savory, Giligan’s, Icebergs, Il Padrino, Jack’s Loft, Kalye Juan, Kenny Rogers Roasters, Mangan, Max’s, Mexicali, Mongkok, Mr. Choi Kitchen, TGI Friday’s, Pancake House, Papa John’s, Pho Hoa, Pizza Hut Bistro, Quiznos, Sci-Fi Café, Seoul Garden Hot Pot, Sizzling Pepper Steak, Sushi-Ya, Teriyaki Boy, Thai Ktichen, The Old Spaghetti House, and Zoricho. Now for the giveaway.. I am giving away 2 tickets (1 winner only, so you can bring a date :)) in this blog. You get to choose the date! There you go! Let's play some good music!